Manolo says, behold! The Shoes of the Iceman. Lined with hay and held together by a net of rough string, the leather shoes look bulky, itchy and downright uncomfortable. But if they were good enough for Oetzi, the 5,300-year-old man found in an alpine glacier in 1991, they’re good enough for the modern foot, insists Petr Hlavacek, a Czech shoe expert who has created replicas, taken them out for a walk and pronounced them far better than most modern footwear. “These shoes are very comfortable. They are perfectly able to protect your feet against hard terrain, against hot temperatures, against cold temperatures,” he said, showing off the replicas in his office at Tomas Bata University in this eastern Czech town. Like going barefeeted, only you look like the dork. Manolo says, this shoe it could be the bestseller with the hippies of the crunchiness, but only if the hay it is replaced with the hemp. This entry was posted on Monday, July 11th, 2005 at 11:18 am by Manolo the Shoeblogger and is filed under Shoes. You can follow any responses to this entry through the RSS 2.0 feed. Both comments and pings are currently closed. The Ice Scribe, she does not like these slippers of the Ice Man. Nor does she play on the team of the hippies of the crunchiness. Ice Scribe, when she is not wearing the ice skates, wonders what shoes she can wear for the walking? Perhaps the Manolo could instruct with some examples of super-fantasticallness? If he has time and is not too busy, of course. Manolo, poor Oetzi and his footwear deserve a break! Given the terrain Oetzi was traversing, these are to be compared with Timberlands and other hiking boots of appropriate ruggedness, not the pretty shoes for the city. And compared with Timberlands, I must say, they are not that far uglier. Please do not attempt to bait the Manolo into the discussion of the Ayn Rand. Such things makes the Manolo’s head hurt. The may have been super fantastic 5,000 years ago, but so were “earth shoes’, and how many of us have a moldy pair of THOSE in the bal of the closet somewhere? Well, NOT The Manolo, of course. The Shannon, she does not understand, is this the purpose of shoes? 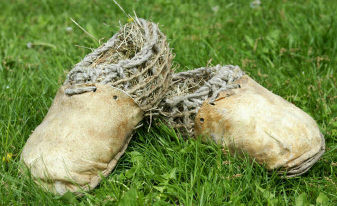 Behold the shoes of the Oetzi! For keeping warm the footsie! Safe from rocks, the tootsie! Protected from rain and schmutzie! – although their owner is kaputzie. “Try going with these shoes to the train station,” Hlavacek said. “The main problem is connected with fashion.” Indeed. I still think that hay looks horribly scratchy. Not unlike the natural wool socks much favored by the hippies of the crunchiness for pairing with the Birkenstock Bostons. Eerie how the Oetzi shoe resembles the Boston, like viewing an old photo of a long-departed ancestor. Just add hay! The Tia wonders — are these prehistoric Uggs? Hm. I have made myself simple shoes and though they are not as convincingly ugly as Oetzi’s they were amazingly snug and comfy. I suppose the homemade shoes are always like that. Induvidualized fit and all. Oh! I must have missed something, as I was not attempting to bait the Manolo into the discussion of the Dagney Taggart with my comment. I was merely piggybacking upon a similar comment made in another recent post and meant no harm. Now I am curious, but I will refrain from asking as I do not want to the Manolo to suffer from the ache of the head.